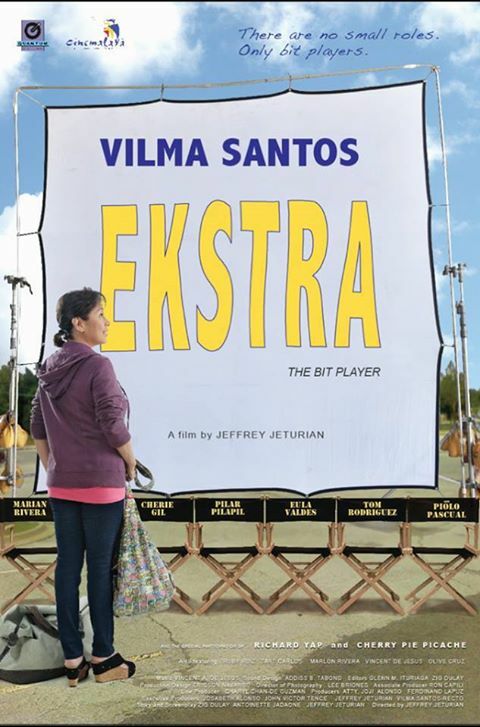 The Cinemalaya film entry, Ekstra, tackles the structure of the showbiz industry. Even though the movie revolves in one shooting day of a television soap opera, the audience will be be able to deduce the hierarchy of the people at work. The movie is able to show how the network executives, directors, assistant directors, the whole cast and crew and even the bit players or extras interact in and out of a soap opera scenario. It has shown that in this kind of industry, power play is at work and the people who have the most power or least influence are exposed. The movie feels real. It is emotional all throughout. It’s amazing how a day in a life of Loida, a bit player or extra in a simpler term, can show a wide range of perspectives even though it is only her side of a day’s life and work that is focused. So, how is a life of an extra? Well, extras are shown in the movie to start going to work in the wee hours of the day even before some of the crew start coming. They are shown to do continuously what they are told to do even the camera is not pointing towards them. Some of them are summoned right there and then for a certain role and they have to show something good (i.e. impromptu acting) if they want to be chosen for the role, albeit very small. Jeffrey Jeturian, the movie’s director, is able to tell Loida’s tale with no inhibitions, which could taint the dignity, the pride or the image of the characters the cast portrays. Kudos also to him and the other writers of the movie who are able to make the story like it’s the audience’s story or at least part of their story, pulling strings in the heart that could make anyone relate to it. Needless to say, Vilma Santos is brilliant as Loida, the bida in Ekstra. She easily surpasses the expectations brought to her by her showbiz industry title. And just like what I said about Nora Aunor in Thy Womb, Vilma Santos completely transformed herself into the role of a bit player in this film. She amazingly became the character herself. I didn’t find Vilma but Loida through and through. I guess veteran actors have already mastered the art of role-playing for they can completely transform into the role they are portraying. With Santos in the film are strong character actors as well that include Marlon Rivera (the hot-headed director of the TV show), Vincent de Jesus (the easily annoyed assistant director), Ruby Ruiz (the casting director), among others. Even the extras in the film did well portraying as extras (no pun intended). Some of the bit players in the film had dialogues that mention all the people working in their production are important. Yes, that’s true. But it doesn’t take away the fact that some of them in the team earn better while some just receive a bit of it despite the exploitation. There are key players and there are supporting ones in any team and for the team to work, everyone should do their part. The work would be incomplete if the team is not complete. However, this doesn’t take away the fact again that even though people are equal, some are more favored than the others. Such is the predicament not only of the people in showbiz, but in all walks of life.